The FINANCIAL -- The analysis of the world’s most complete skeleton of an early human ancestor, conducted by a research collaboration involving the University of Liverpool, offers conclusive evidence that human ancestors became efficient upright walkers while they were still substantially tree dwelling animals. 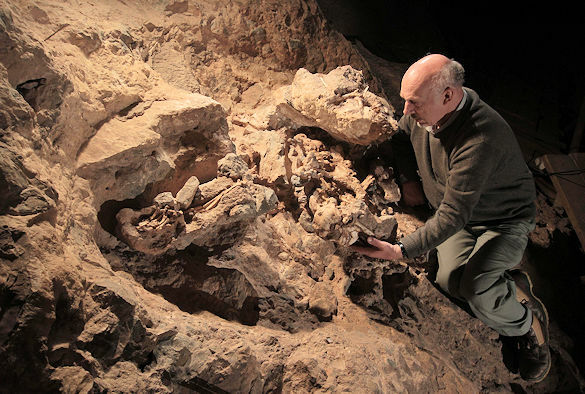 The first bones of the 3.67 million old skeleton, specimen StW 573 nicknamed ‘Little Foot’, were 12 foot bones and leg bone fragments identified in boxes in the 1990s. The rest of the skeleton has undergone two decades of painstaking excavation, cleaning, restoring and analysis. It was found in a very deep cavern, with the bone embedded in a concrete-like matrix. The bone is very delicate and in some cases literally paper-thin. However, it has given scientists a far greater understanding of how our species evolved. The over 90% complete skeleton of an old female, much more than twice as complete as the famous Lucy, and considerably older as well, Little Foot is a member of the genus Australopithecus, a widespread and varied genus of hominins to which Lucy belonged, and which was an early precursor to modern-day Homo sapiens which appeared roughly 300,000 years ago. Little Foot is the first fossil of Australopithecus ever to have been discovered with its limbs intact. The studies support the argument of her discoverer, Professor Ronald Clarke of the University of the Witwatersrand, that there were two species of Australopithecus living at the same time in South Africa’s ‘Cradle of Humankind’, Australopithecus africanus, which was small, like Lucy, and probably primarily tree-dwelling, and Australopithecus prometheus, which was probably just within the range of modern human stature. As part of the study, which has been reported in Nature Science, Professor Robin Crompton, Honorary University of Liverpool Research Associate in Musculoskeletal Biology, and his colleagues analysed how she would have walked. Professor Crompton, states: “This hominin, for the first time in the fossil record, had longer lower limbs than upper limbs, like ourselves. This is an important finding, as the slightly older hominin Ardipithecus, which came before Australopithecus, had longer arms than legs – more like other great apes such as the gorilla. “That means she was being selected for long stride length in bipedalism. Moreover, unlike Lucy, ‘Littlefoot’ had a hip joint like our own, able to transmit large forces from the trunk to the leg and vice versa. Although Little Foot’s legs were longer than her arms, they had not yet achieved the great relative leg length found in humans. Thus, she would not have been as good at carrying objects as we are. However, she would have been much better at climbing trees than modern humans. “It is most likely that she would have resided in an area that was a mix of tropical rainforest, broken woodland and grassland, through which she would roam around. She would have lived primarily on forest fruits and leaves”. Next Article Spending Too Much Time on Your Phone?